U.S. Women's National Soccer Team forward Megan Rapinoe, right, tries to get around Japan's Risa Shimizu, left, with the ball during the first half of SheBelieves Cup soccer match, Wednesday, Feb. 27, 2019, in Chester, Pa. The U.S. tied Japan 2-2 in a friendly match in the run-up to the World Cup in June. 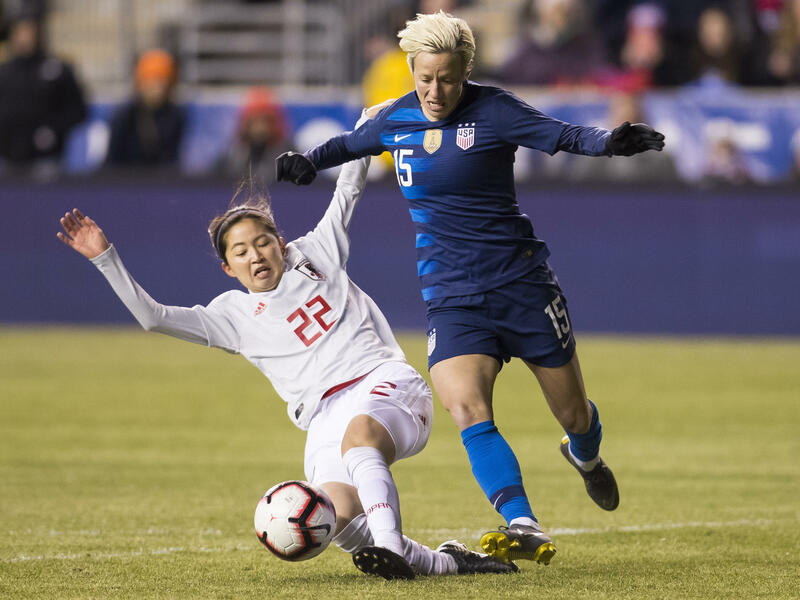 The top-ranked U.S. Women's National Soccer Team is back on the field Saturday afternoon playing against number four England in Nashville, Tenn. The SheBelieves Cup also includes top-ten powerhouses Brazil and Japan. The U.S. and Japan played to a 2-2 tie on Wednesday. While the U.S. is hoping for a better result today, the real focus is on preparations for June. That's when the Women's World Cup begins in France. The U.S. is heavily favored as the defending champion (and three-time winner of the event). At a news conference on Friday, Coach Jill Ellis said these 'international friendly' games in the round-robin tournament are a good gauge to see where the team is strong and where it's not. "The most important piece is we're playing against world class teams before we get ready for the summer," Ellis said. "All of the experiences we take in now are massive in terms of having us be ready." Against Japan, the U.S. attacked repeatedly and controlled the game at key moments. But it gave up two late goals including the equalizer in the 91st minute when it appeared the U.S would finish with a victory. Veteran forward Megan Rapinoe said the squad needs to do a better job controlling the game and keep its focus. "I feel good where we are in our preparation," she said. "We'll forever have stuff to work on. But I feel like things are coming together well and we're having a more solidified idea of the way we want to play and I think you can see that on the field." During the team's pre-game training on Friday at Nissan Stadium in Nashville, the U.S. team looked loose and relaxed, despite overcast skies and a chilly wind in the 40-degree weather. Teammates joked and smiled and mugged for photographers. Defender Abby Dahlkemper said, while the team isn't worried, the squad does need to tighten up: "Really taking advantage of every single minute we can on the field together. Tweaking the things we need to tweak, getting better and learning and really hitting our peak in June." FOX will broadcast the U.S./England game at 4:30pm E.T. Brazil and Japan play at 2pm E.T — the latter available to stream on ussoccer.com. The SheBelieves tournament wraps up Tuesday in Tampa, Fla., when the U.S. takes on Brazil.